Shiba Skins allows you to assign images, colors, and more on a page by page basis. 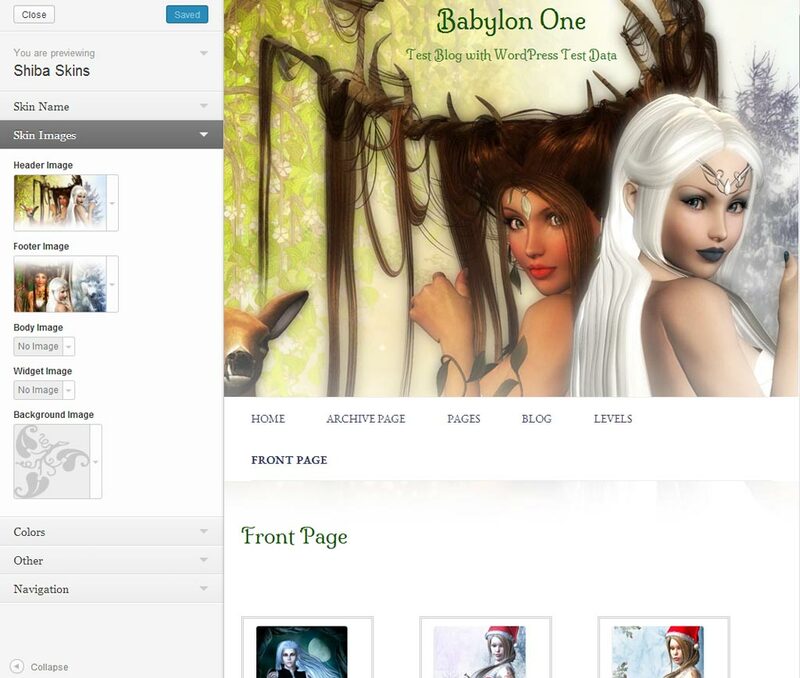 Theme customization options are saved into a skin, which we can then be applied to a specific post or to a group of post objects. 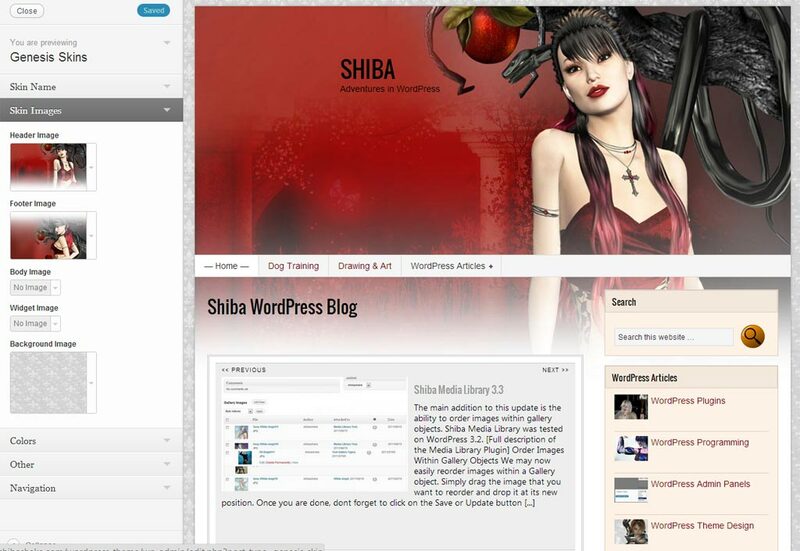 Shiba Skins contains similar skinning functionality as Genesis Skins, but is built on top of the Twenty Twelve framework, which is free and developed by WordPress. Since it is based on Twenty Twelve, it is mobile responsive and supports all the other Twenty Twelve functionality. Metaboxes in settings page are now active. They can be opened/closed as well as dragged and dropped. Updated settings page to use standard WP messages. Force background page shadow color to only be a darker shade. Many other theme options including header and footer heights, blog title position, blog border styles, fonts, blog width, and more. Skins are easily created and edited using the existing WordPress theme previewer interface. Theme images can be selected from the media library or uploaded from our local computer. A set of mobile responsive header and footer images are available here. Shiba skin creation interface, which expands on the standard theme previewer interface. Before post and after post widget areas. Theme options are saved into a skin object, which can subsequently be assigned to individual posts and pages, categories, tags, and more. This allows us to visually group our blog content by assigning different color schemes and images to different sections. A metabox is added to the edit post, page, category, and tag screens, which allow us to pick the skin we want to assign using a drop-down menu. Example list of Shiba Skins. Shiba Skin objects can be used as is, in the Genesis Skins Theme, and vice versa. Here are detailed instructions on how to create and assign skins. Both child themes create and use skins in the same way, therefore, just replace Genesis Skins with Shiba Skins in the tutorial. 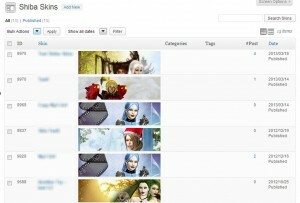 Skins can be exported to and imported from other blogs using the standard WordPress import/export facility. In this way we can easily move skins across different sites. Add Google Fonts by hooking into the shiba_skins_fonts filter. Shiba Skins is a child theme of Twenty Twelve, therefore it is mobile responsive and supports a variety of page layouts. Add our own google fonts by hooking into the shiba_skins_fonts filter. Note that the first name (e.g. Tangerine) has to be a valid font on Google Fonts. The theme will only load the first font from Google. The code above adds Tangerine to the drop-down menu on the Shiba Skins >> Settings page. From there, we can select to use it in our blog. 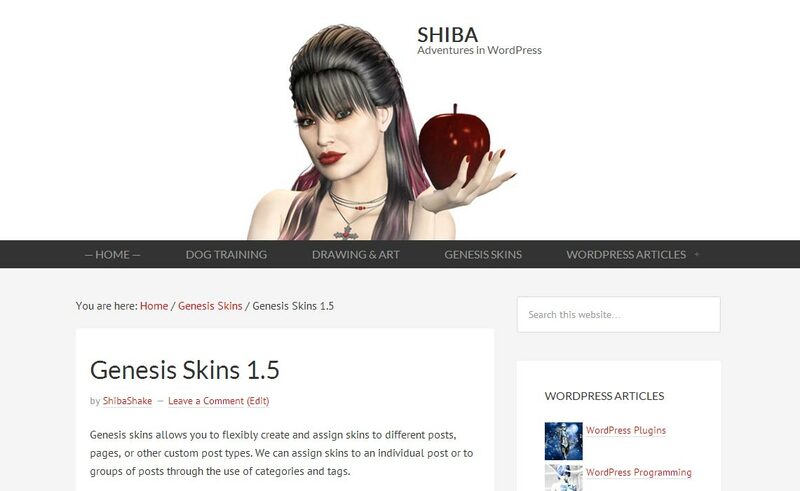 This entry was posted in Genesis Skins and tagged custom wordpress theme, custom wp theme, shiba skins, skin wordpress theme, skins, skins wordpress theme, skins wp theme, wordpress theme, wp theme on May 13, 2013 by ShibaShake.